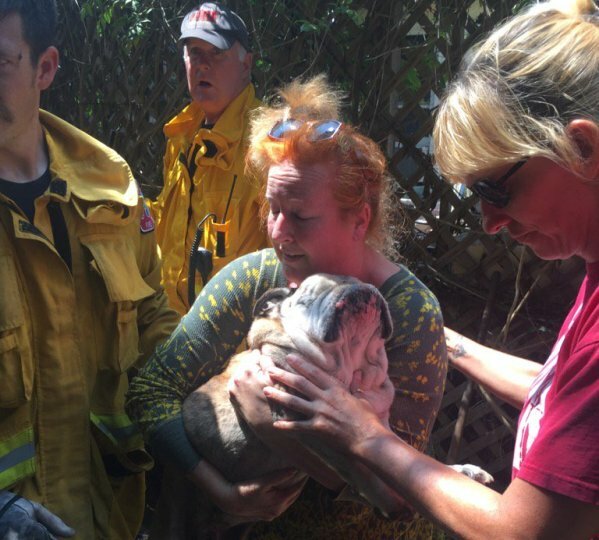 Lassie wasn’t around to alert the owner of Angus, a blind, 14-year-old English Bulldog, that her dog had fallen into a well, but luckily firefighters from Costa Mesa, Calif., came to the rescue of the elderly pooch. Angus fell into the 10-foot well in his backyard four days ago, KCBS reports. His dog mom, Robyn Hubbard, said Angus hadn’t barked and she wasn’t even aware there was a well in her yard. A neighbor discovered it while helping her search for Angus. Angus, who has no eyes, hadn’t been in the backyard for a year. “He can’t even really walk from the bed to the den,” Hubbard said. He’d suffered several seizures earlier this week, and she thought he may have wandered off somewhere to die. “Obviously, he’s not on his last legs like I thought he was,” she told KCBS. To free Angus, the firefighters dug an access hole next to the well. One of the firefighters was then lowered head first into the well to pick up the dog. The rescue effort took almost an hour. After being reunited with his grateful dog mom, firefighters were nice enough to transport both of them to a local animal hospital, where Angus was evaluated. Amazingly, Angus was dehydrated but had no broken bones and is in good condition, KCBS reports. In a photo tweeted about two hours after his ordeal, the old boy appears to be resting comfortably at the animal hospital. This has been a terrible, busy week for Southern California firefighters due to the devastating Blue Cut Fire and other wildfires made worse by the state’s severe drought. Just a few days ago, a dog who’d been “sheltering in place” near a burning structure in the Blue Cut Fire ran and leaped into the arms of Cal Fire Battalion Chief Mike Mohler. Thank you, firefighters, and stay safe!